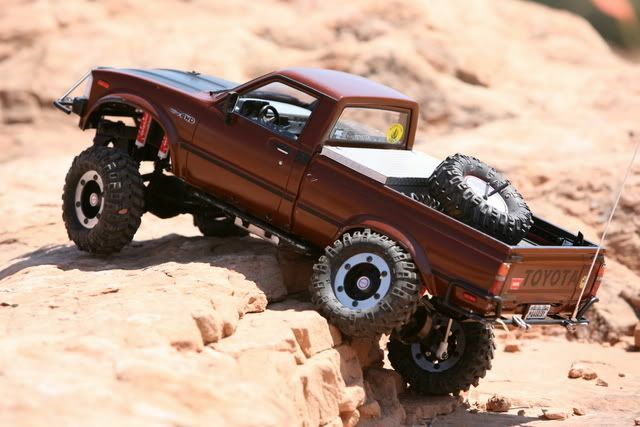 Scale 4x4 R/C - Featured Ride Winner! Congratulations to Mike a.k.a. 1badjeepbruiser for taking the victory in probably the most exciting Featured Ride contest ever. With over 30 entrants it was the largest Featured Ride contest we've ever had and the voting was tight between 4 competitors. The end result was a tie between 1badjeepbruiser's scale Hilux and Wild Trial's custom tube Jeep. That lead to only the 2nd tiebreaker in Scale 4x4 R/C history, with 1badjeepbruiser pulling out the win with votes tallying 65 for 1badjeepbrusier to 49 for Wild Trial. But don't let that 16 vote margin fool you, this contest was much closer than those numbers show!! !